I hope that it might be understandable when I say that I approached The Last Lovecraft: Relic of Cthulhu with some caution. I hadn't really heard anything about the film from my usual sources and only came across the title while randomly browsing on Netflix. I checked out the trailer and knew then and there that I had to give this one a watch. In case it had gone unnoticed by the casual web visitor, I'm something of a closet geek for the writer HP Lovecraft and his Cthulhu mythos. Tales of the Great Old Ones have long captured my imagination and are one of the cornerstones of my horror genre fandom. Unfortunately, there have not been too many good films based on his works. With Re-Animator as one of the few exceptions, I've been fairly disappointed with Lovecraft-based films in general. The Last Lovecraft: Relic of Cthulhu tells the tale of Jeff (Kyle Davis), the last living descendant of the author HP Lovecraft. 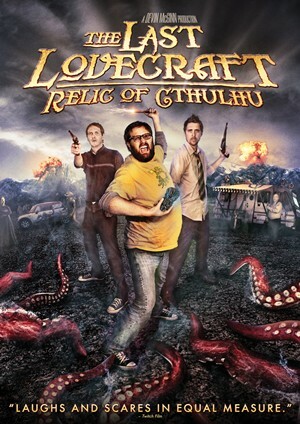 Together with his slacker friend Charlie (Devin McGinn), Jeff is charged with protecting the Relic of Cthulhu and preventing it from falling into the hands of an evil cult. Having already resurrected the general of Cthulhu's army, Starspawn, the cult wants to use the Relic to awaken Cthulhu and thereby bring about the end of the world. It's a suitably heady situation to force upon the bumbling, unsure heroes and serves well as a framework for a horror-comedy. I thought that the use of Lovecraft and the Cthulhu mythos was particularly inspired and congratulate the writers for making the idea work. It's not often that I think of the Great Old Ones and think comedy. The seriousness and gravity Lovecraft lent his writings provides the perfect juxtaposition for the tongue-in-cheek approach employed here. Further, I thought the film did a great job summarizing the mythos and simplifying story points such that the uninitiated should have no problem following along. A slick and entertaining animation sequence helps quickly cover large amounts of exposition, serving to fill in the back story and allowing the audience to watch Cthulhu brandish a decapitated Triceratops head as a weapon! A win-win situation, if there ever was one. The acting is strong overall, but I feel that the supporting characters overshadow the lead. Kyle Davis plays a solid everyman-type hero but cannot compete with the boundless energy injected by Devin McGinn's performance. Although the majority of the film's runtime is spent on the two leads, the real highlight of the film for me was the nerdy sidekick character, Paul (Barak Hardley). Whether breaking both of his arms or awkwardly trying to give away a friendship bracelet, Hardley demonstrates superb comedic timing and is a real pleasure to watch. I hope to see more of his work in the future. Another highlight for me was the quality of the overall production, which was generally quite high. This movie demonstrates good cinematography, particularly for an independent film. Further, it's not often that direct-to-DVD films have copious amounts of special effects, especially practical ones, and it's even rarer that the effects look as good as they do here. There are a few monsters with some fun, creative designs that get a decent amount of screen time. The way in which these creatures and effects are filmed and presented reminded me a lot of Guillermo del Toro's Hellboy films, by which I mean they are generally well-lit and unabashedly put on display. The filmmakers want the audience to see these creations and to celebrate in their other-worldliness. In short, the effects are as good as can be expected for a film of this budget, even if they aren't all exactly perfect (looking at you, fish-wolf things). The Bottomline: The Last Lovecraft: Relic of Cthulhu is a fun, entertaining film that horror-comedy fans will want to see. The film is hugely successful given its independent roots and budgetary constraints. Highly recommended and available now on Netflix. Three Bruces. I watched this film by mistake thinking it might be a more serious work, having been a lover of Lovecraft books, and the associated R.P.G. in my younger days. I agree with a lot of the points raised and especially the fact that Lovecraft has been overlooked in the movie world, or badly represented. I was pleasantly surprised, entertained and have become fond of this quirky take on a Road Trip movie. A fun and intelligent homage to a horror genius.